'Tis the season! Sugar-plum fairies and green-vested elves...twinkling lights and tinkling bells. Before you know it, you're in the swing of the holidays...dusted with flour, sprinkled with sugar, laced with icing, and dipped in chocolate! Even for moi...the potato-bread-cheese girl...baking cookies and sweets just seems like the thing to do once the month of December rolls around. It's almost automatic for many I know. Like good little nutcrackers ("nut" being the operative word), marching to the same drummer, we bake dozens upon dozens of cookies over just a few short weeks and, miraculously, they're devoured...all of them! 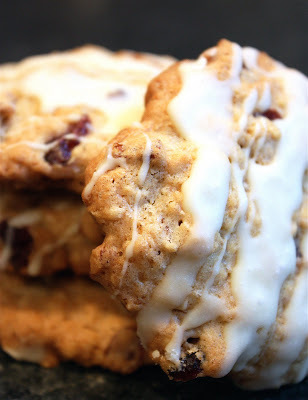 Well, in addition to our traditional favorites -- iced sugar cookies, pecan sandies, jam prints, and fudge -- this little cookie is one we added to the party a few years ago. It has the perfect balance of sweet berry, nutty crunch, and decadent chocolate drizzled lightly over top. This final lacing of chocolate gives you just enough of that sweet goodness in every bite without being overly sugary. I've tried this cookie with chips mixed into the batter and it's truly just a little too much (and I love chocolate! )...and reducing the number of chips means you don't get enough chocolate in each bite...and that's just not right either! So...while the drizzle is an extra step (an easy one), it works great. And lest you think that this cookie's yummy goodness is its only claim-to-fame...it's also quite pretty...dotted with holiday red cranberries and wintery-white chocolate...a perfect little gift of a cookie. 2. In a large bowl, cream butter with sugars. Add eggs and vanilla and beat well. 3. In a separate bowl, combine flour, baking powder, salt, baking soda, and oatmeal. Add to butter mixture and mix well. 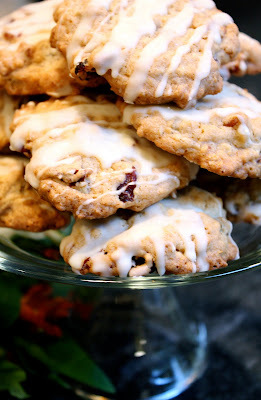 Stir in dried cranberries and pecans. and bake for 10 to 14 minutes, until just lightly browned. Remove to cool on a wire rack. Repeat until dough is finished. 5. 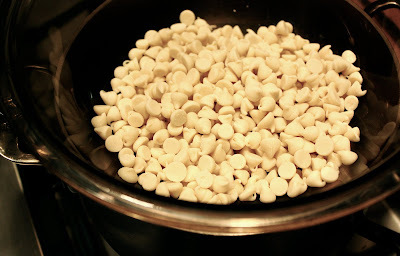 While cookies cool, place chocolate chips in a double boiler (a glass bowl over a pot of boiling water...with water bowling to just below bottom of bowl without touching). 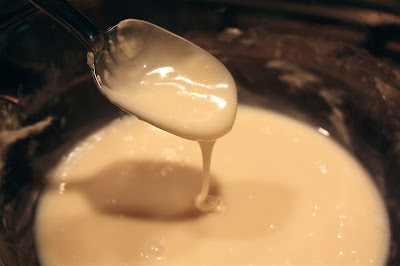 Stir chips as they melt, adding a bit or all of 1/3 cup milk to loosen consistency. 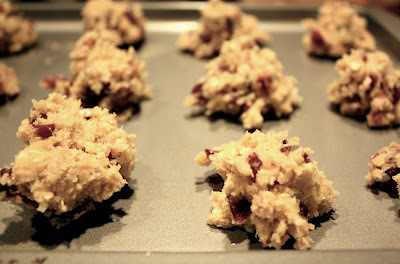 Once completely melted, remove from heat, stir to cool just a bit and then drizzle over cookies. (If you arrange cookies in closely-set rows -- on wire rack placed over foil or wax paper to catch drips -- you can easily drizzle in long sweeps across rows of cookies...which makes it super easy!). Let cookies cool completely so that chocolate hardens.